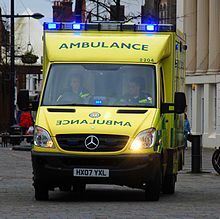 Emergency medical services in the United Kingdom are provided by the National Health Service systems through local ambulance services, known in England and Wales as trusts. Scotland, Wales and Northern Ireland have one ambulance service each; the Scottish Ambulance Service (a Special Health Board), the Welsh Ambulance Service, and the Northern Ireland Ambulance Service. England is divided into ten regional ambulance services. An ambulance responds to a 999 call in Fareham, Hampshire. Ambulance trusts may also undertake non-urgent patient transport services on a commercial arrangement with their local hospital trusts, or in some cases on directly funded government contracts. This service is free for patients, and paid for by the hospital.[source?] In some place private firms do this job instead, but it can be a big source of money for the trusts. Before 1974 local councils used to run the ambulance service. In 1974, they were merged into larger agencies that covered one or more counties. On 1 July 2006 the number of ambulance trusts fell from 29 to 13 and they were replaced by regional services. Each of the 9 government regions of England are covered by a single NHS ambulance trust, with the exception of the South East region. This region is split between the South Central and South East Coast ambulance trusts, while the Isle of Wight has a special arrangement in which local hospitals provide the ambulance service. The Scottish Ambulance Service is a Special Health Board funded directly by the Health Department of the Scottish Government. In 2006 the service answered over 520,000 emergency calls. Scotland also has Britain's only publicly funded Air Ambulance service. It has two Eurocopter EC 135 Helicopters (based in Glasgow & Inverness) and two Beechcraft B200C King Air fixed-wing aircraft (based at Glasgow & Aberdeen). The Northern Ireland Ambulance Service (NIAS) is the ambulance service that serves the whole of Northern Ireland, and was set up in 1995. As with other ambulance services in the United Kingdom, it does not charge its patients directly for its services, but is funded through general taxation. To answer medical emergencies in Northern Ireland, NIAS has over 270. The Service employs approximately 1044 staff based across 32 stations & sub-stations, 4 Control Centres and a Regional Training Centre. The Welsh Ambulance Service NHS Trust (Welsh:Ymddiriedolaeth GIG Gwasanaethau Ambiwlans Cymru) was set up on April 1, 1998 and has 2,500 staff providing ambulance and related services to the 2.9 million residents of Wales. Private ambulance services are becoming more common in the UK. They often providing medical cover at large events, either with, or instead of the voluntary sector providers. Some organisers use a private firm instead of a voluntary ambulance service because of wider availability during the week (sometimes difficult for a voluntary service to cover) or for a wider range of skills, such as provision of qualified Paramedics. The most common use for private ambulances is for Patient Transport. Many trusts and hospitals choosing use a private company, instead of the NHS service. Private ambulances do not answer emergency (999) calls. Sometimes a private ambulance company is used as a follow-up, for stretcher transport or going non-life-threatening calls. Recently, some companies have been contracted to provide additional emergency crews and vehicles to supplement the core NHS staff at busy times (such as New Year). All ambulance companies and the NHS Ambulance trusts must follow the same laws, so a private ambulance must have the same equipment and the people working in it be as qualified as the same type of NHS ambulance. Another type of private ambulance are those operated by undertakers, who generally favour black vans, with the words private ambulance written discreetly on the vehicle. They are used for taking bodies between hospital, embalmer and chapel of rest, rather than use a hearse. St John Ambulance emergency/multi-purpose ambulance. The main voluntary ambulance providers are the British Red Cross and St John Ambulance in England/Wales, Northern Ireland & The Islands, and St Andrew's Ambulance Association in Scotland. The Order of Malta Ambulance Corps. can sometimes be found in Northern Ireland also. These groups have been providing both emergency and non-emergency medical cover in the UK for over 120 years, including active service in both World Wars. This is before any government organised service. The main activity of the organisations apart from training and education, is providing ambulance cover at events, as an extension of their First aid contract. Depending on their agreement, or agreements, with their local ambulance service trust (known as a Memorandum of Understanding or MOU), they may treat and transport certain categories of patient to hospital, although for more serious incidents, such as cardiac arrest it is likely that they would be expected to summon the assistance of the statutory ambulance service. Both organisations also provide 'reserve' or 'support' cover to some, though not all, of the ambulance trusts (dependent on the local MOU), where ambulance crews from one of the organisations (who are usually volunteers, but in some instances may be paid staff) will attend 999, GP Urgent or PTS calls on behalf of the ambulance trust. In these cases the organisation is paid by the trust. This service is most often called on during major incidents, when there is a high level of staff absence or when there is an unusually high call volume, although in some areas, voluntary crews are regularly used to supplement full-time trust cover. Both organisations have also provided cover for the public when NHS ambulance trust staff have held strikes or walk outs. Big White Taxi Service is a nickname sometimes used by NHS ambulance staff in the United Kingdom. They use it because the 999 emergency number is often misused by people who do not need an emergency ambulance, but could go to their own local General Practitioner. ↑ 1.0 1.1 1.2 1.3 1.4 "NHS Information on Ambulance Services". Retrieved 2007-06-14. ↑ "Ambulance Service Definition". Retrieved 2007-06-15. ↑ ""What is an ambulance trust?"". NHS.UK. Retrieved 4 February 2019. ↑ "Taking Healthcare to the Patient". COI Communications for the Department of Health. June 2005. Retrieved 2007-06-15. ↑ 6.0 6.1 "NHS Ambulance Trusts List". Retrieved 2007-06-15. ↑ "Scottish Ambulance Service Website". Retrieved 2007-06-15. ↑ "Scottish Ambulance Service Air Wing". Retrieved 2007-06-15. ↑ 9.0 9.1 "Northern Ireland Ambulance Service Trust". Retrieved 2007-06-15. ↑ "Welsh Ambulance Services NHS Trust". Retrieved 2007-06-15. ↑ "Welsh Ambulance Services NHS Trust Contact Details". Retrieved 2007-06-15. ↑ "Meetings with destiny". The Guardian. Retrieved 2007-12-29. This page was last changed on 4 February 2019, at 23:27.